We would like to inform you that consumption tax will be changed from 01/10/2019. For details, please visit our website for the fees. The charge is 1,080 yen no matter what time you enter the store. Rental fee is not included. It can not be combined with other discounts. It is the lesson of the direction where it is climbed for the first time. It is a lesson that learns top rope climbing. An introduction to artificial wall climbing, covering safety concerns,terminology,equipment use and basic movement. This is a lesson for children only. It is a lesson that can be taken by the family. We are sorry to inform you that we are now renting the chalk bags for a fee of 100 yen. 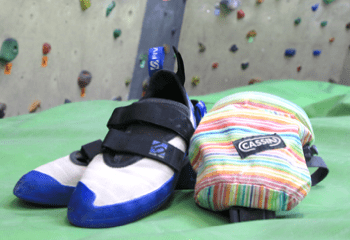 You can buy a chalk bag, a belt, a chalk ball, and a chalk in our gym if necessary. Please make sure to use a chalk ball in our gym.